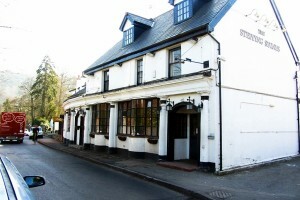 The Surrey Branch AGM began at 8.00pm at the Stepping Stones in Westhumble Street, in Dorking. Unfortunately for us our usually clubroom had been booked by another club by mistake, as Tina the landlady of the pub was not there at the time to stop it. Tina made available the side of the restaurant for us, and boarded and closed that side off so we could have some sort of privacy for our event. We had over 25 members arrive for the AGM, and we welcomed a new club member to the Surrey section. This was Rod Daniels who had bought a 1959 Norton Dominator 99 two months previously. He is having problems with his coil ignition as it has had a Boyer conversion added to the engine. Ken Rawlinson our secretary has offered to go over and have a look at it for Rod. The minutes for the last years AGM were noted from 8 November 2017, and questions asked for any matters arising from them. Mike Petryszyn our chairman then read out his report, concerning the sections activities through out the year. The branch has had an amazing selection of speakers and events that we have attended, and Mike went on to explain in detail of all that had transpired at these events that the Surrey section had attended and represented the NOC at. Mike was very loudly applauded for all his efforts on behalf of the Surrey section. Our Treasurer, Geoff Cole presented a very comprehensive list for all those members present, which was a draft of income and expenditure and a balance sheet. Geoff has done an incredible job of our treasurer. He has been in hospital for a while after a very bad fall, and he is now able to drive his car so he could attend this AGM. However, he tendered his resignation from the post of treasurer at the meeting, and offers of help/nominations to fill this post are now sought. As I am the Press Officer for the branch, I explained to the AGM, what I had done could be read in the many past editions of the Roadholder. I also explained about the up and coming Brooklands Motorcycle Show that will be on Sunday, 30th June 2019. I have contacted Donna Marshall, and she has sent me an application form for this event. The Surrey section will have our gazebo at this event, for all owners of Nortons to come along and be part of this show with us. We will also be at the Ardingly, the South of England Classic Show, on the 31st March 2019, and the Surrey section will be celebrating the 70th anniversary of the Dominator twin. I asked all those present with any type of Dominator twin to bring it along for display at Ardingly. Julie Diplock, who organizes this event, has set aside a large area for this Norton Dominator celebration for the Surrey section. I also asked the AGM, as we have many owners who have a huge amount of expertise with their own particular bikes to give the section a talk next year. Paul Gibbons suggested that he had a friend who could come along and give us talk about those who had been awarded VC’s in combat in the last 100 years. I also put forward a suggestion to give a talk on the Hybrid bikes, but I was metwith blank faces, and deaf ears. So a big no then. Simon Smith our Facilities Officer gave his report of what has transpired through out the year, and what extra equipment will be required by the section. Ken Rawlinson told the AGM, that we were planning to get a TV with a DVD added so that we could play these on our stand at our events. Simon also explained the section was investigating getting sale panels for our stand to give it more of a higher profile. 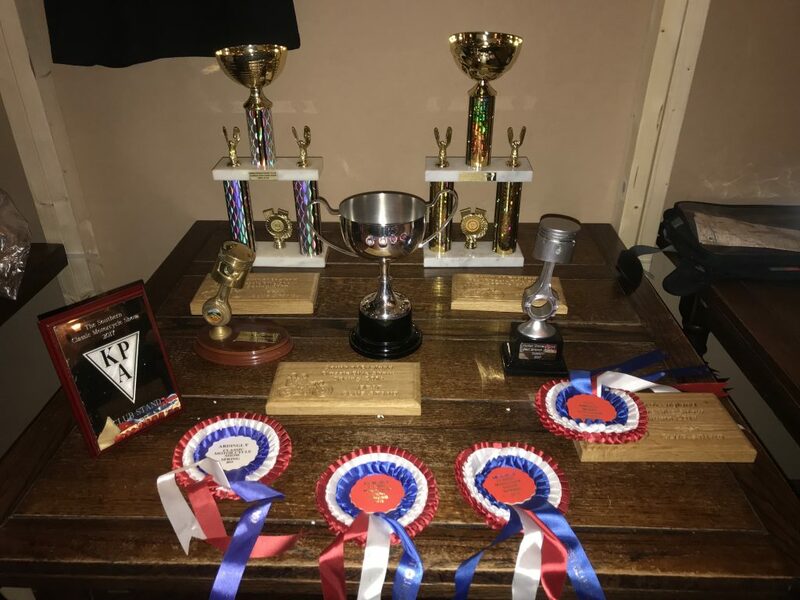 Simon had also brought along all the trophies and rosettes that the section had won over the previous ten years, and laid them out on display for those at the AGM, to see. It was a very impressive lay out on the table of all that the branch has won over the previous ten years. The awards that the Surrey section has been awarded over the last ten years. John Blades our Website Officer explained all that he had done to upgrade our website and to have added all the stories that the Press Officer had sent him, through out the year. John also informed the AGM about the two ride outs to Jacks Café that he had lead this year, and also asked the AGM if there were any other locations that the members would like to visit. One location John mentioned was a ride out to the Sammy Miller museum in New Milton. John was thanked by the AGM for being such a very accomplished ride leader, and for organizing these ride outs for the section. Ken and Simon also brought along our club shirts and Hi-Viz, vest’s if any one attending wanted to buy any of the items on display. The committee at this point all stepped down, and were all re-elected, except Geoff Cole, who has decided he would not stand for re-election for 2019. The section will be looking for a new Treasurer. We then came to the Club Member of the year award for the 2018 year. This was given to Simon Smith after a vote, as Simon performs an amazing job for the branch, and with out his good self, and his pick-up truck, and trailer, the branches equipment would be not have been transported to any of our events. We extended our grateful thanks and our appreciation, to Simon for playing such an integral and very important role for the Surrey section. Simon was presented with the Member of Year trophy by Mike Petryszyn our re-elected chairman. Mike Petryszyn presenting Simon Smith with the Member of the Year award. The section will be having a branch dinner at the carvery in Ewell East, on Saturday 17th November. This is to celebrate the 10 years that the Surrey branch has been in existence. This has been arranged by Ken Rawlinson our re-elected Secretary. Ken had informed the AGM that he had ordered the new 2019 calendars for the branch should any one require one, that they should contact him to obtain one. Ken Rawlinson also explained to the AGM, about all the up and coming events for the coming year of 2019. A question was raised at the AGM from Phil Hannam concerning the timing of the start of the club night talks, and the AGM. Phil explained that those that had far too travel home and also were in employment arrived home later, due to distance that they needed to go to get home. The suggested new start times will be debated by the committee for a start of 7.30 to 7.45pm in the evenings if we have a talk. We then came to the Any Other Business section of the AGM. This was a very special award that was given to both Graham Holcombe and Oscar Frieslaar who have always supported the Surrey section and always come along to all our events. Graham and Oscar were amazed at this award, we had just given them. Graham thanked us for the award and this consisted of two club shirts. Graham explained that they had original come along for help with Oscars Norton 650ss Dominator, and because the Surrey section was so friendly, and helpful, they had both decided to stay. I then told Oscar to get his 650ss running again and display it on our stand at Ardingly in March 2019. Ken Rawlinson has agreed to help Oscar to get the bike running once more. We also had Mike Duffell come along as Mike, has, had a very bad fall, he had been in hospital for a while, and he was still in a lot of pain due to what had happened to him. Oscar Frieslaar, left, and Graham Holcombe right in the front row with Mike Petryszyn on the right, with their awards and the re-elected committee behind them. The committee had arranged with the Stepping Stones for a buffet to be provided for the members, along with both tea and coffee to be provided. The AGM then finished at 8.45pm, and all those on the committee were thanked by the membership for all their efforts on behalf of the section. Committee Members Present – Mike Petryszyn, Geoff Cole, Anthony Curzon, Simon Smith, John Blades and Ken Rawlinson. Minutes from last Committee meeting 8th November 2017 – Accepted by the Committee and members. Matters arising from the minutes There were no matters arising. Mike had prepared a Chairman’s report of the year and said that the club had had an incredibly successful year. 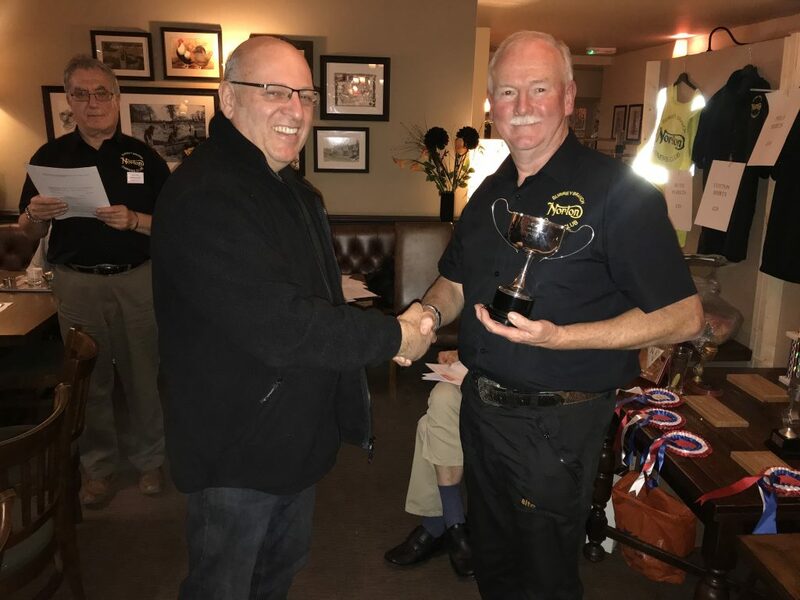 The branch had attended many events during 2018 winning a few trophies for best club stand and bike commendations including Ardingly (April and October), Kempton Park (May), Brooklands (July) and Warlingham (July where we won Best Club Stand beating all other vehicle stands). On top of this we had our BBQ in June, which was open to the public, and raised over £700 for the Joan Seeley Pain Relief Trust, Colin was in attendance and we had some very nice bikes on display including a Loris Capirossi MotoGP bike, Mike Hailwood’s BSA Daytona Rocket 3, Steve Hislop’s TT Honda RC30, two special Suzukis including a monocoque and one that had been ridden by Barry Sheene and many more. We had several talks at our club nights by Peter Ashley, Henry Dulat, Norton Hawes, Bill Vero, Mike Jackson (The NOC President on his career with Norton Villers and his desert racing in America) and Alan Ford (Wall of Death), the club is extremely grateful to the people who gave these talks. We also had two Ride-Outs to Jack’s café which we are grateful to John Blades for organising. Geoff Cole will unfortunately be standing down and the club thanks Geoff for the tremendous help and support that he has given to our branch over the years. Mike thanked the committee and club members for supporting the club and attending events and hoped that this would continue and even be improved on in 2019. Geoff handed out end of year accounts sheets to those that wanted them. Our main income is from subscriptions and the main expense is running the club events and providing necessary equipment. This year we got a welcome grant from the main NOC club and we hope that we will again be in line for a grant in 2019. The club has a healthy bank balance and at present is fairly well stocked with equipment although we are continuing to consider further purchases. 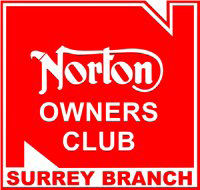 for use at our events in promotion of the club and the Norton name. We were sorry to learn of Geoff’s recent accident but are pleased that he is now well on the way to recovery. In the very unlikely event of the branch folding it has been agreed that any money left in the bank account will be distributed equally between all paid up members as that time. Subscriptions were taken by Geoff Cole on the night, if anyone has not yet paid their subscriptions then will they please do so either by payment to Geoff (for now until a new treasurer has been elected) or online. The club subscription would normally run from the AGM night as it makes life a little easier for the hard pressed treasurer but they will be adjusted should there be a large discrepancy in the period of membership. The membership fee has been held at £10 per annum and is not likely to change for the near future whilst we are getting grants from the main NOC). Anthony has been very active during the year and has submitted reports on all of our events to Roadholder magazine and the website. So many thanks Anthony. Anthony did a fine job “conducting” the AGM. Simon Smith explained what had been going on during 2018 as far as the equipment goes, we are investigating the obtaining of a TV with DVD so that we can show DVD’s, getting two banners one being “70 years celebration of the Dominator” and one “60 years celebration of the NOC”. We are also investigating getting “sail flags” for our shows. Simon had brought along our display of trophies that the club had won of the past few years. Polo and cotton shirts were on display and these were for sale, the cotton shirts at £20 each and the polo shirts at a one off £6 on the evening (normal price £10). These shirts will be available for purchase on our club nights and at our events. John explained what he was doing in upgrading our website and also our Surrey Facebook page and mentioned about having Ride-Outs in 2019 including Jack’s café again and possibly the Sammy Miller Museum if there is enough interest. If any member would like a Ride-Out to any other place please let a John or another member of the committee know. The club is very grateful for John’s hard work for the club and for his capable leading of the Ride-Outs. The existing committee members all stood down and with the exception of Geoff Cole agreed to stand for re-election and this was agreed, proposed and seconded by attendees. We all thanked Geoff for the excellent work that he has carried out over the years for the club. Please note that should any member wish to be involved in the running of any of our events then please contact the committee as you are very welcome to come and join us. The chairman confirmed that Club Member of the Year was Simon Smith for work carried out on behalf of the club during 2018. Simon does a lot of work in storing all of our equipment, loading it up and bringing it to all of our shows as well as bringing it to our club nights when we have talks, Simon is also heavily involved in running the club and attending our many committee meetings. Simon was handed the trophy by Mike our chairman. The AGM had 25 people in total attending the AGM, the evening was very cordial and sandwiches were provided with tea and coffee if required. There will be no formal dinner in 2019 but there was to be an evening meal at the Toby carvery in East Ewell on Saturday 17th November. 2019 Calendars will be available in the near future so if any members would like one please let Ken know, if bought in “bulk” the large calendars will be £6.00 each and the desk top ones are £3.00 each plus postage unless they are collected on a club night. An order has been placed for calendars which have already been ordered by members. The next club night will be on Wednesday 12th December, this will be just a pint and a natter night. Club night on January 8th will be our games night against our colleagues the Velo Fellows, they won this year so we must up our game, there will be FREE tea/coffee and sandwiches. It is proposed that on the February 13th club night to have a quiz against the Velo Fellows so please make a note and come along. Ken Rawlinson will be issuing a comprehensive list of events that the SNOC will be involved in as well as other main events that may be of interest to members and this will be sent out in the near future, if anyone would like any events added to the list please let Ken know. Our first show will be at Ardingly on March 31st 2019 where we will be celebrating 70 years of the Dominator so please bring you bike(s) along (other models are of course welcome), Rex Butcher will be the Guest of Honour and he may bring his mate Paul Smart along and Mike Braid is bringing a genuine Dunstall Dominator which Rex may well have ridden. There will also be our usual shows at Kempton Park (May), SNOC BBQ (June), Brooklands (June), Warlingham (July) and Ardingly (October) and we may also have a SNOC “Norton Day” at Ryka’s café in early September where we will have our gazebo and hopefully a large display of bikes. If any of our members have any ideas for either events or suggestions they would like to see or changes made in the branch then please let the committee know as if we do not get feedback then we cannot make or introduce changes and can only assume that we are doing things right which may not be the case in the eyes of all of the membership. The aim of the committee is to not only promote the Surrey NOC branch but also the main NOC. The branch has several accomplished and skilled members so maybe they would consider giving a talk one club night about their own particular engineering skills and achievements over the years with the involvement and building and repairing of old motorcycles. If anyone would like to give a talk or should anyone know of anyone who may be willing to give a talk on any interesting subject, and not necessarily being restricted to motorbikes, then please advise the committee. 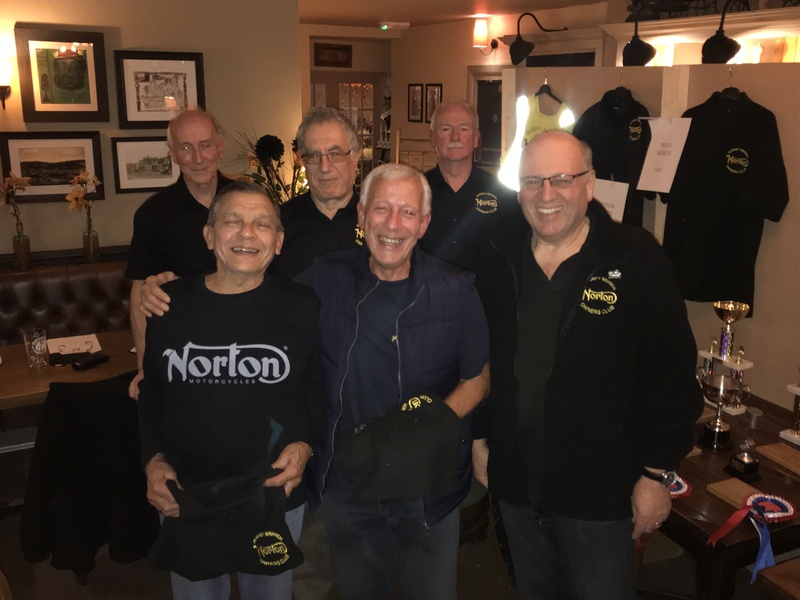 As Graham Holcombe and Oscar Frieslaar had attended all of our club nights over the past 18 months at least and also many of our events during 2018 they were given a SNOC polo shirt as appreciation of their enthusiasm and support. Graham Holcombe thanked the club for the polo shirts and said that he does not own or ride a bike let alone a Norton but that he came along one night to support Oscar who has a 650SS (laid up in his garage but hopefully it will be re commissioned by Ken) and he found the club so friendly that he joined, so well done club members for being so nice and friendly and long may that continue. The committee wishes you all an excellent Xmas and a Happy New Year and also very safe riding in 2019.